You'll have everyone wrapped around your finger when your package is presented wrapped in the confines of this lace-up ambition Male Leather Pants. These flattering trousers feature an eye-catching front pouch with corset-style lacing through silver grommets. 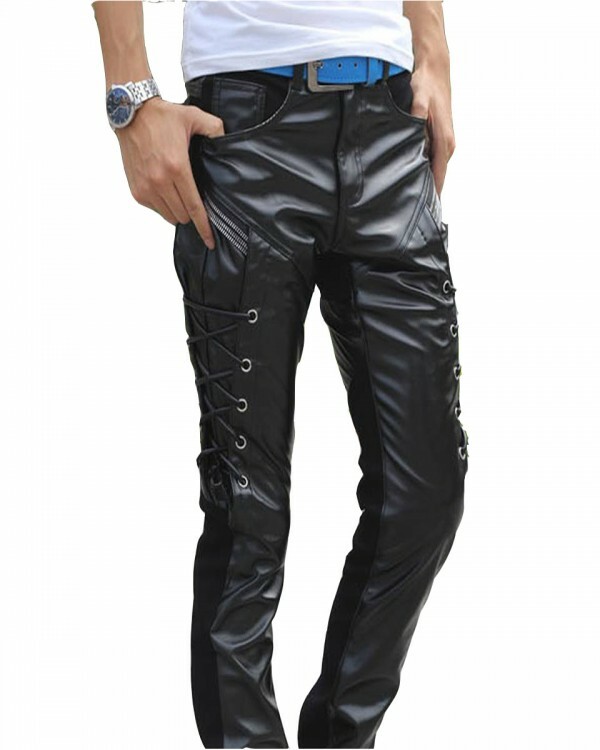 You'll have everyone wrapped around your finger when your package is presented wrapped in the confines of this lace-up ambition Male Leather Pants. These flattering trousers feature an eye-catching front pouch with corset-style lacing through silver grommets. 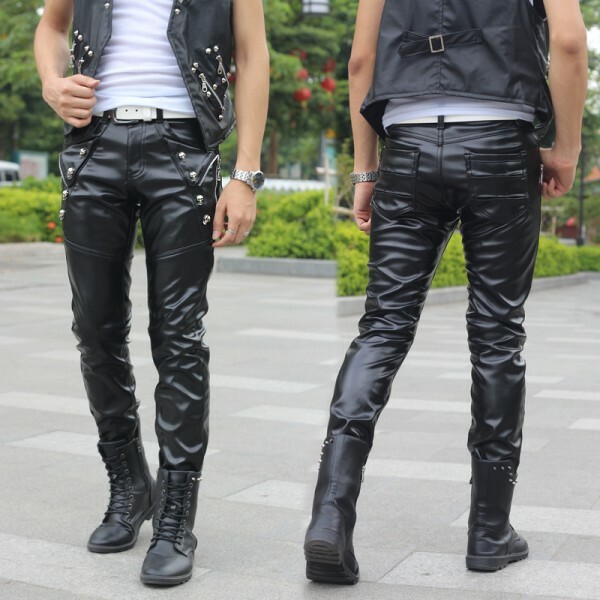 A favourite for cosplay costuming as well as for leather fetish enthusiasts, male leather pants feature silver stud accents similar to the studs shown on denim jeans. Further adding to the jean-like look of the leather pants is their five-pocket style with single and double front pockets and two patch pockets on the back. Loops at the low rise waist make the leather trousers belt-ready. The pants feature straight legs that will be cut to the length that you specify. Order now in your choice of seven colours. The leather was real, the quality was great, and it arrived in a timely manner.Love the quality and price. I really enjoyed! Everything was done quickly & I liked the videos. Everything was straight forward and easy! Wonderful online shopping experience.Customer service was outstanding.When I compared with other website prices on leather baba website, I found leather baba's product best in all. This black leather pant is skinny fit. This garment is new and unworn.This is a pair of highly comfortable leather pants that offer maximum protection and abrasion resistance. Shipping 3 weeks. the quality is excellent, size came just too wide gate. height 174 weight 76 took XXL. and everything is fine. I advise everyone to this seller. Love this store, designed and made clothing, wonderfully inventive, cleverly designs, nicely constructed and in a variety of styles.I got a lovely old fashioned style slip there among many other cool items. Looks good. Fit Size. Lightweight. Happy to buy straight leather pants.